As explained on our <Home Page> there is a theme to our endeavors. The story of Isaac's three wells in Genesis 26 represents to us a telling of a possible future for people of faith in which earlier conflicts between different traditions are erased, while maintaining their unique distinctions, thus creating a new openness to understanding of our common faith. 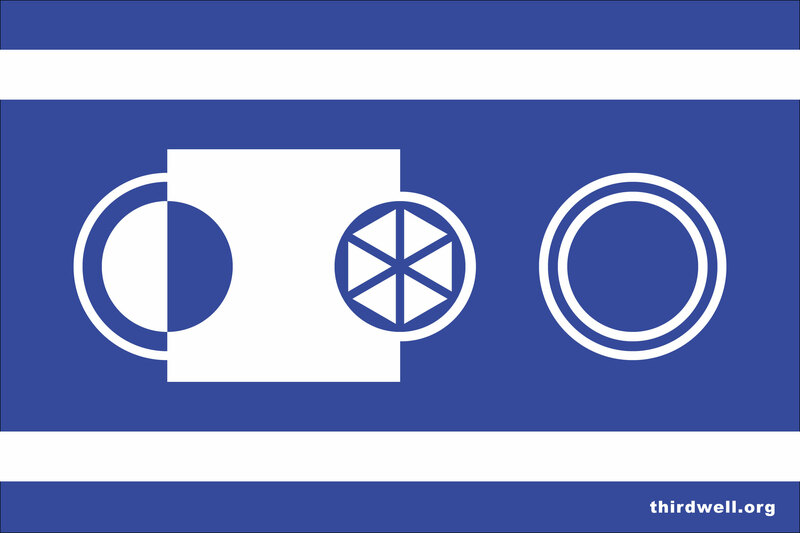 The class flag design represents that theme in a modern artistic interpretation of a left to right flow of the three wells. The first two wells representing increased first argument and then hostility are tied together by the white rectangle. The last well, representing spaciousness, openness, freedom, and a new accord is free of the earlier hostilities and separateness.